At Wednesday's faculty meeting the ad hoc committee to review with alcohol policy put forth a set of extraordinarily draconian proposals on alcohol with little acknowledgement of their massive implications. With their sweeping scope and ludicrously broad definition of Institute funds, the proposals would in effect create a dry campus and impinge, probably illegally, on individuals' personal freedoms. The recommendations are unreasonable and inappropriate, and we strongly urge President Charles M. Vest and Academic Council to reject them. The proposals as they stand expand on Vest's current ban on the use of Institute funds to purchase alcohol at events where anyone under 21 will be present. The committee proposes retaining that ban, with possible exceptions for those who receive prior approval based on adherence to the committee's standards. Approval would be granted on a case-by-case basis by the senior officer in each area. In the case of student events, that person would be Dean for Student Life Margaret R. Bates. But the committee defines Institute funds as any money spent by anyone on any event even tangentially related to MIT, including personal funds. Their definition would include, for example, money spent by an MIT fraternity, money spent at an off-campus function in any way connected with MIT, or money spent by anyone on any MIT property. As Clay said, the committee made sure to leave no loopholes. But the scope of this definition is ludicrous, as Clay himself illustrated in an example he gave of the application of the rules. Clay said that if he invited some students from a class he taught to an informal dinner at his house, the funds he spent out of his own pocket on the dinner would qualify as Institute funds. Indeed, President Vest himself might be in violation of the rules if he kept alcohol in his office or in his Institute-owned house and had a student under 21 as his guest. It is doubtful that such ridiculously overreaching definitions could hold up in the courts. 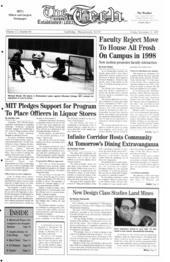 Whether or not the committee acknowledges it, people do have personal freedoms outside of MIT that, within the limits of the law, permit them to spend their own money any way they would like. Initially, this ad hoc group appeared to be a simple administrative review group for the Institute's alcohol policy chaired by Clay, who heads many such reviews. The group's recommendations go far beyond the scope of a mere review, however; in effect, the group has put forth a bold recommendation for a dry campus without explicitly admitting it. Considering that the scope of the committee's review was so wide, students should have been included as members on the committee, which was simply a panel of three administrators. The committee did meet with a number of students, but their opinions appear to have played little or no role in the committee's recommendations. Clay acknowledged that the one statement the committee heard over and over again from students was that they want to feel treated like adults. But in a seeming dismissal of this important concern, Clay made no attempt to actually address it. The committee's proposals do little to add to the sorely lacking campus-wide introspective dialogue on alcohol. Indeed, they do not so much as acknowledge one of the few efforts made to look at and improve the way we implement alcohol restrictions - the proposals passed last week by the Interfraternity Council presidents. While the presidents' proposals likely have little chance for survival among the rank and file of fraternities, they at least represent a well-intentioned stab at better student self-governance on alcohol that the ad hoc committee could have considered in its proposals. As they stand now, the recommendations put forth by the committee are unacceptable. MIT does not need reactionary, draconian measures. Understandably, MIT must be sure to protect itself from alcohol liability suits, particularly because the alcohol liability laws in Massachusetts are so vague. But the Institute already has the rules it needs to operate in accordance with the laws. What it needs is education, faculty-student interaction, and a will to enforce the reasonable rules that already exist.